The replacement of several teeth using dental implants with individual crowns, or a with a fixed bridge supported by implants, makes your teeth feel functional and fit in a way that can not be achieved with other treatments. In general, this process will be completed after just a couple of visits to your dentist. What is the process for replacing teeth? Appointments and planning: These include the initial examination, the diagnostic imaging of the tooth, a questionnaire about your medical and dental history, and a conversation with your dentist about your treatment options. 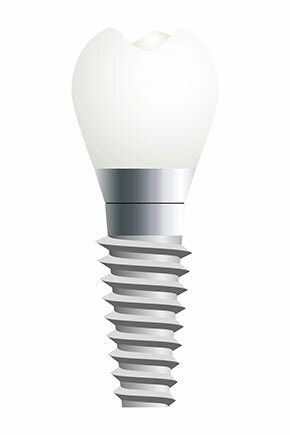 Placement: We are talking about the placement of the implants that will be used to support the replacement teeth. Temporary teeth can be placed while the implant is integrated into the natural bone to form a solid base for the replacement teeth. Most people return to work the next day, and any type of discomfort can be treated with regular-use analgesics. Abutments: The placement of the abutments (the small extension that will connect the replacement teeth on each implant, if necessary) is also an important step of the teeth replacement process. A fixed bridge: The placement of a fixed bridge supported by implants or custom-made replacement teeth (crowns) will be the final step. What other options do I have for teeth replacement? Removable partial dentures are another alternative for teeth restoration, but it does not provide the stability offered by teeth restored with dental implants. This device can interfere with everyday activities such as talking or eating. Even though this type of restoration is less expensive, it does not offer the natural look or functionality of teeth supported by implants. If you would like to learn more about teeth replacement, or if you want to schedule your first appointment to begin your process, contact our dental office in Pasadena to find out which treatment option is most convenient for you (626) 577-2017.